Monkey waiters in Japan … At the Kayabukiya tavern just north of Tokyo, Yatchan and Fukuchan serve customers hot towels and drinks, and are given soya beans as tips. Watching Yatchan and Fukuchan scurrying around the restaurant getting items for the customers is more ambition that I have seen by many human wait staff recently. At the Kayabukiya tavern just north of Tokyo, a pair of monkeys in jackets and shorts scamper over to the mini-oven, open the door and dish out hot towels to the patrons. One thing is for certain it is sheer marketing genius as the patrons think the monkeys are better waiters than some really bad human ones. The younger of the two, Fuku-chan is quick to give the diners a hot towel to help them clean their hands before they order their drinks, as is the custom in Japan. Yat-chan and Fuku-chan, who are both certified by the local authorities to work in the tavern are well appreciate by customers, who tip them with soya beans. 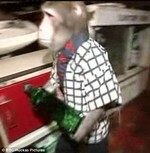 ‘The monkeys are actually better waiters than some really bad human ones,’ customer Takayoshi Soeno said. Tavern owner Kaoru Otsuka, 63, originally kept the monkeys as household pets – but when the older one started aping him he realised they were capable of working in the restaurant. Well, let’ send the CEO’s of the big three, there to learn how to work. hey, we have monkeys serving the people in congress why not serving people as waiters? It’s not customary in Japan to tip waiters (one of the many good things about living there), but I imagine that these dedicated employees deserve any gratuities they can get. Japan has also been pioneering the use of robotic dogs as companions to lonely elderly people.